The Red Lentil attracted some unforeseen press following the tragic bombing at the Boston Marathon. 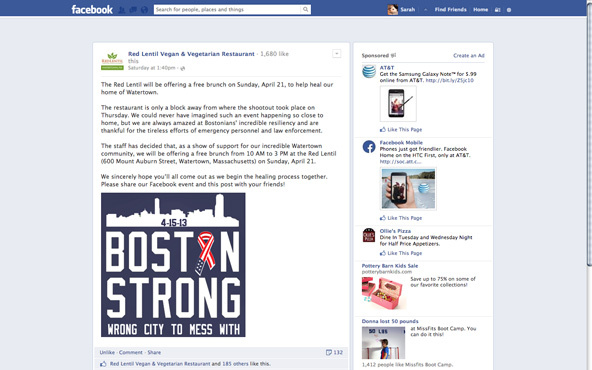 The ensuing manhunt took place in the Watertown, MA, neighborhood that this vegan/vegetarian restaurant calls home. Local and national news featured the restaurant as a landmark; the shootout that took place early on April 19 was just a block away. We received a call on Saturday, April 20, 2013 from the owner, who has been our client since 2011. He and the staff had made a tremendously generous decision: to serve brunch for free for 5 hours on Sunday, a gesture they hoped would help heal the community. We had less than 24 hours to try to attract as much support and press as we could. Luckily, this client already has some key online marketing techniques in place: email marketing with an ever-growing list fed from a short form on their website; active Facebook and Twitter pages; and a popular website that they update nearly every day with lunch and dinner specials. We had all the elements in place that we needed to put those techniques to work in a big way. The first step in getting this promotion off the ground was updating their WordPress website by adding a Boston Strong–related slide to the homepage slider and creating a landing page that we could drive people back to throughout the day. 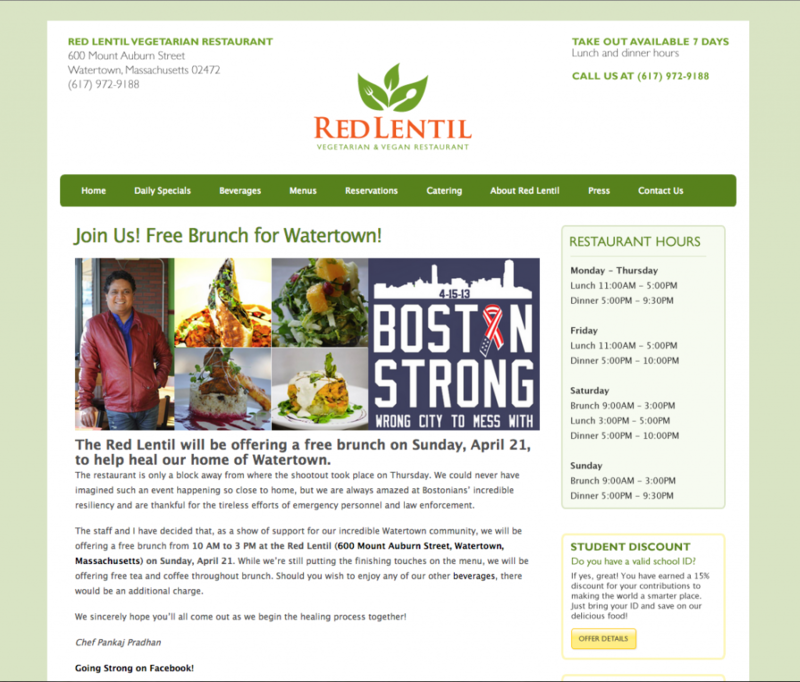 Imagery was just as important as the event itself, since we needed something positively identifiable by Boston-area residents that we could tie in with Red Lentil’s promotion. 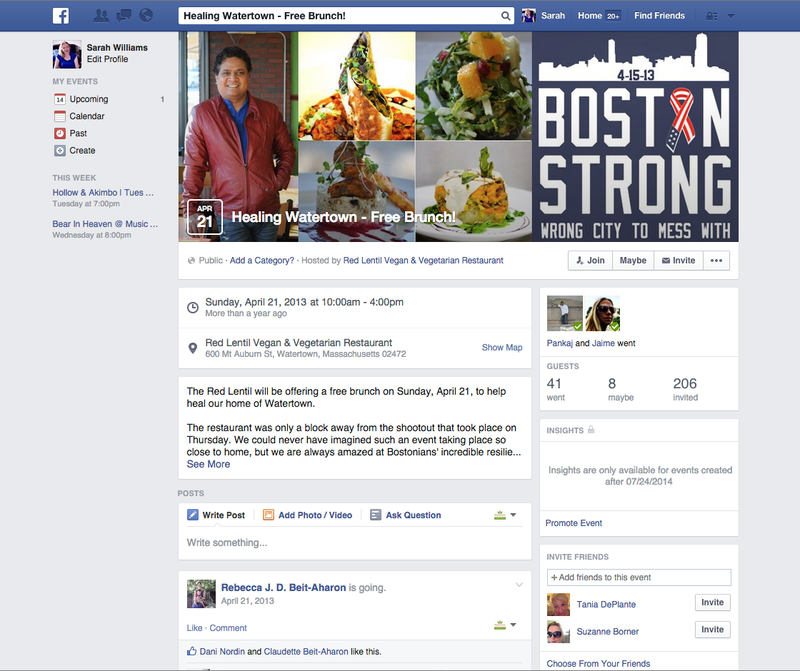 We found a strong image online that had been created to exemplify Boston Strong, and we paired it with photos from the Red Lentil kitchen, which set the tone for the image we’d be using for the subsequent social media posts and email marketing. 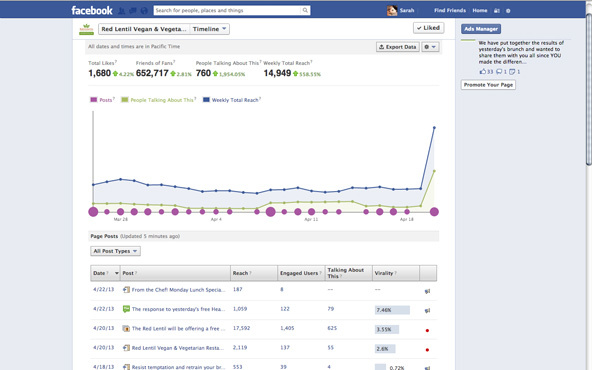 Our most aggressive tactic in this campaign was to use Facebook to make the brunch go viral. The restaurant already engages its fans, with our help, on a weekly basis, so it’s not surprising that the popular eating spot’s promotion began to spread within minutes of us posting it on Facebook. First, we changed their cover photo and created a Facebook event. The cover photo and the event photo mirrored the image we used on the website, with one addition: a picture of the owner’s smiling face. In crafting the copy for the post and the event, we repurposed what we had used on the landing page on the website, as well as the simple Boston Strong graphic. To date, the post has been seen by 17,500+ people, shared 130 times, received 188 likes, and commented on numerous times. We then babysat the page, so to speak, responding to questions and interacting with fans who were both overwhelmed by the gesture and appreciative of the effort. In fact, the generosity of the act spurred others to want to help, requesting information as to where donations could be made to help defray the cost (the owner donated all the money they received to One Fund Boston). Throughout the day on Sunday, we responded to those who wrote to thank the restaurant for the brunch, and on Monday, we posted a formal thank you to everyone who came out and who spread the word; the post attracted 81 likes. In order to keep the momentum going just a bit longer, we shared a couple other Boston Strong–related posts: a T-shirt that someone had created to help collect more donations for One Fund Boston, and a link to a blog post written by a Watertown resident about the brunch. All throughout this week, the restaurant has continued to post to their page as they normally would. While Red Lentil’s Facebook page feeds to Twitter automatically, they’re not as active on Twitter as they are on Facebook. However, Twitter provided excellent access to local media and helped push the event to a new level, particularly with the use of common hashtags, such as #BostonStrong. Twitter was the third highest traffic source for website visitors for this period. 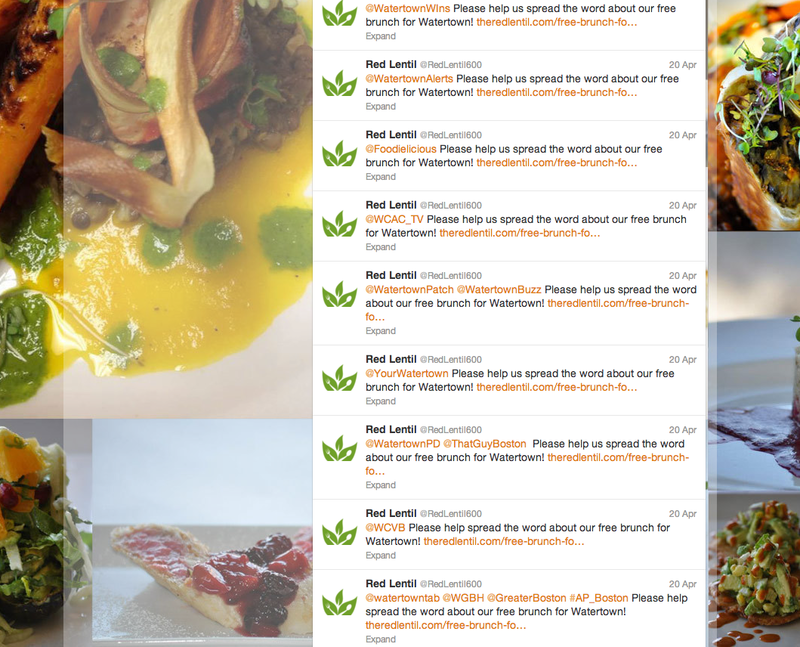 We tweeted directly to local media outlets and tweeted back to anyone who tweeted us. The event was, at first, overshadowed by the Boston Red Sox game – not surprisingly! – but soon picked up momentum as people began retweeting and sharing. In fact, we couldn’t even keep up with number of mentions we were getting across Twitter. We shared their grateful tweets, followed back, and generally tried to keep the energy flowing. We found that Twitter was the main place for people to send out pictures from the event, so we followed up on those and retweeted as well. Using their email marketing program of choice – Vertical Response – we sent an email out to their entire list to promote this event, using all the same copy and graphics repurposed. In addition to our efforts to contact local media through Twitter, we also personally emailed the Boston Globe‘s online and print editors to notify them of the event. Vertical Response was the fourth highest traffic source for website traffic for this period. We were so completely overwhelmed by the response to this event, but also by the generosity of our client. In fact, their generosity inspired a little generosity of our own: we didn’t charge them for the time we spent on this project. Just when you are feeling that it’s always the ‘bad guys’ that get the attention, you read a great story like this! From the generosity of the Red Lentil folks, the support of the community and your generosity in doing your part pro bono…it makes your heart fill with hope. Totally agree! If the world pivoted on this type of generosity, it would be a very different place.